These are yummy but if you're thinking, these kind of taste like prunes, well, plums are what prunes are. I like prunes but if you don't like prunes, be warned. Halve and pit the plums, and arrange the halves cut side up in a 13 x 9 baking pan. Thin about a tablespoon of honey with about a tablespoon of hot water in a small bowl. The hot water will melt the honey a bit, then whisk them together with a basting brush. Brush the thinned honey over the cut plum sides, using it all up. Lightly drizzle the honeyed plums with a bit of olive oil, and sprinkle with a bit of salt and thyme. Roast plums for twenty five minutes, turning the pan around in the oven halfway through if you think of it. 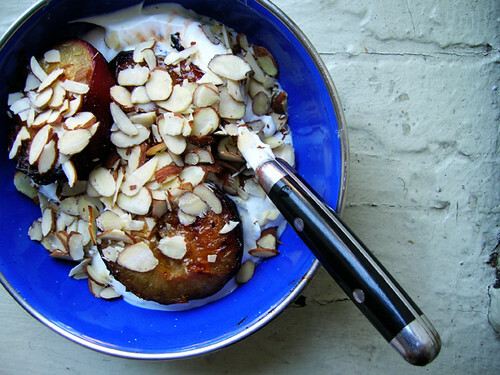 Let cool a bit, then plate three still warm halves right away with some greek yogurt and sliced almonds. The rest you can put away in the fridge to eat cold.